Now may be the perfect time to enter the wearables industry. With the range of products that have appeared in recent years, you can determine which ideas resonate with users and which don’t before leaping into the market. In this practical guide, author Scott Sullivan examines the current wearables ecosystem and then demonstrates the impact that service design in particular will have on these types of devices going forward. You’ll learn about the history and influence of activity trackers, smartwatches, wearable cameras, the controversial Google Glass experiment, and other devices that have come out of the recent Wild West period. 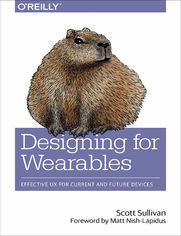 This book also dives into many other aspects of wearables design, including tools for creating new products and methodologies for measuring their usefulness. What is Designs Role in This?